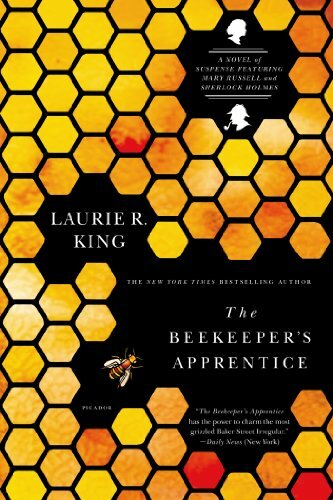 THE BEEKEEPER'S APPRENTICE was recommended to me by a neighbor, a recommendation I was happy to receive. Being a fan of Sherlock Holmes mysteries, the intrigue and intellectual challenge of discovering clues in the various cases has always fascinated me. This was a different concept of the old Sherlock Holmes mysteries, and one that I found to be totally delightful. Mary Russell starts out as a 15-year-old girl, quite the intellectual match of retired and slightly aging Sherlock Holmes. They meet quite by accident, but their relationship blossoms into one of respect for each others intellect as well as a sort of father-daughter bond. Some of the reviews I read stated that the readers thought this was a May-December romance, but I did not see that at all. Definitely NOT. The touching of the hair and light brush of the lips across her forehead appeared to me to be far more "fatherly" than romantic. Set in the early days of WWI, the history and geography brought out in this novel added to the intensity. And although at times I thought the dialogue to be a bit wordy and the day-to-day activities to be trivial, I soon realized that it all came together as Russell and Holmes analyzed the clues set before them. I would give this four and a half wine glasses, but I'll round it up to five. And if you listen to the Audible version, I would give it a solid five. The narrator was wonderful. The Kate Martinelli series, starting with A Grave Talent, concerns a San Francisco homicide inspector, her SFPD partner, and her life partner. In the course of the series, Kate encounters a female Rembrandt, a modern-day Holy Fool, two difficult teenagers, a manifestation of the goddess Kali and an eighty-year-old manuscript concerning Sherlock Holmes. The Stuyvesant and Gray books feature Harris Stuyvesant, a Bureau of Investigation agent who finds himself far out of his depth, first in England during the 1926 General Strike (Touchstone), then in Paris during the sweltering confusion of September, 1929 (The Bones of Paris). King also has written stand-alone novels--A Darker Place as well as two loosely linked novels, Folly and Keeping Watch--and a science fiction novel, Califia's Daughters, under the pseudonym Leigh Richards. King grew up reading her way through libraries like a termite through balsa before going on to become a mother, builder, world traveler, and theologian. She has now settled into a genteel life of crime, back in her native northern California. She has a secondary residence in cyberspace, where she enjoys meeting readers in her Virtual Book Club and on her blog. King has won the Edgar and Creasey awards (for A Grave Talent), the Nero (for A Monstrous Regiment of Women) and the MacCavity (for Folly); her nominations include the Agatha, the Orange, the Barry, and two more Edgars. She was also given an honorary doctorate from the Church Divinity School of the Pacific. Check out King's website, http://laurierking.com/, and follow the links to her blog and Virtual Book Club, featuring monthly discussions of her work, with regular visits from the author herself. And for regular LRK updates, follow the link to sign up for her email newsletter.